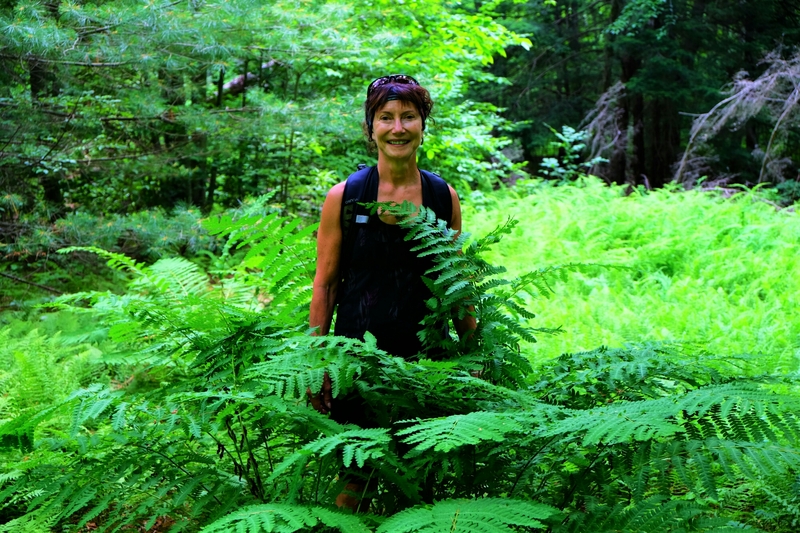 When I agreed to join a local outdoors club trip to the Susquehannock region of Pennyslvania for some hiking and biking, it occurred me how little I’ve seen of small-town America, particularly small-town America in the states closest to my home near Toronto, Canada. When working, I judiciously assigned my annual vacation days to take me to geographies and cultures far different from mine or to Canada’s mountains, lakes and coastlines. The northern USA didn’t interest me enough to use up a precious holiday day. 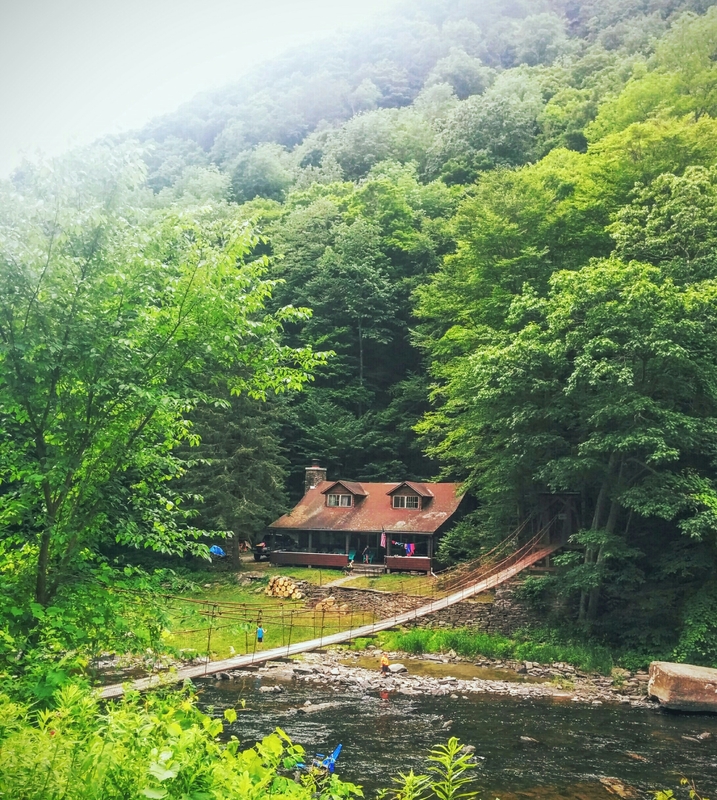 Now, with time not a factor, I took the opportunity when it arose and this trip, just like my visit to the Finger Lakes region of New York State last year, left me pleasantly surprised. Our destination was Potter County on the Allegheny Plateau near West Pine Creek. 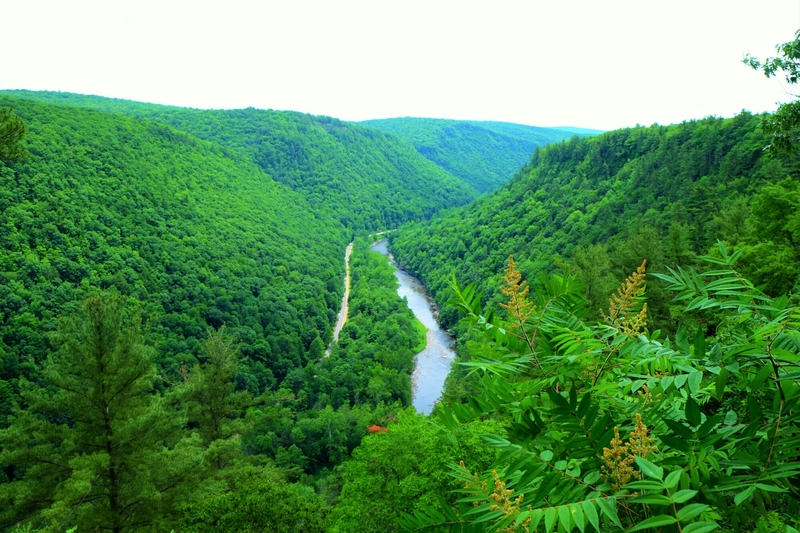 This tributary of the Susquehannock River sits in a deep gorge referred to by the locals as the Pennsylvania Grand Canyon. 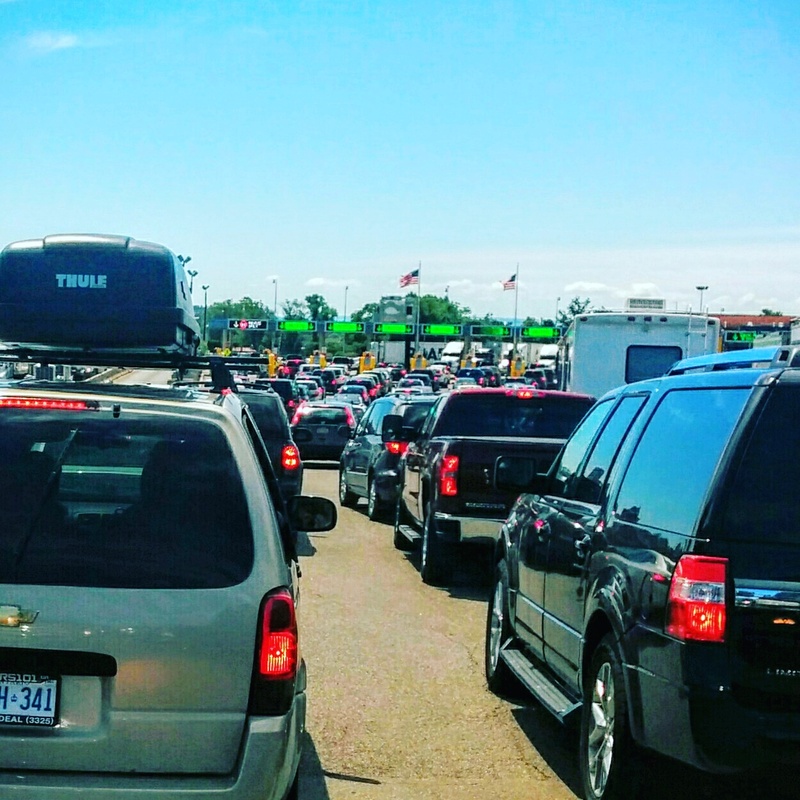 It was a holiday long weekend in both the USA and Canada and the customs queue at the Peace Bridge border crossing was slow-moving. In the summer heat, a man ahead of us frequently got out of his car and fiddled with the engine. The last thing we needed was a broken down car completely blocking our already imperceptible progress. Beside me, a dog poked its head out the car window and barked in my face incessantly as we crept along. I opened my window and barked back; I needed lunch. There were four in our car, each with a different surname all looking quite different and all about the same age. The customs officer asked if we were a family. Did we look like a family? I think he needed lunch too. Once through, an immediate stop for a beer and food at the Pearl Grill craft brewery in Buffalo helped our mood. We arrived at the old lodge in time for a hearty, down-home cooked meal and then took some time to explore the grounds. 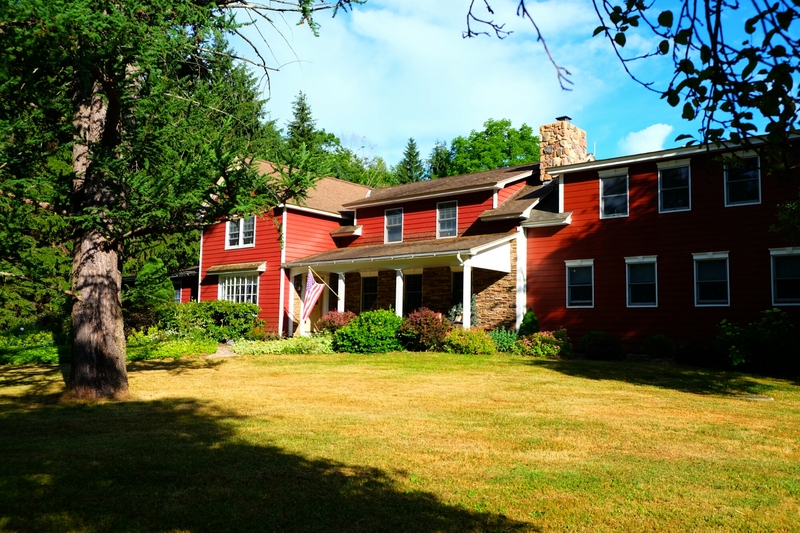 Our group of eleven was staying at a lodge furnished in tired 1980’s Country Living magazine chic (you know the style – braided rugs, plaid sofas etc). 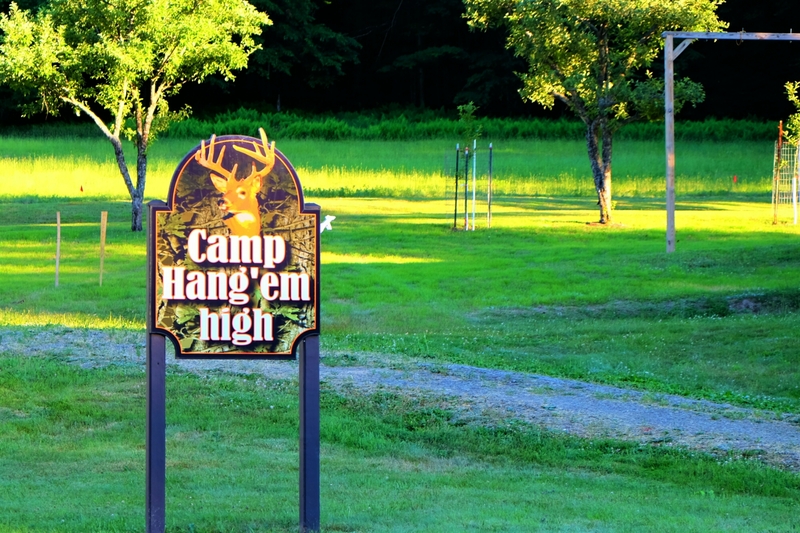 At least it was better than the small, run-down lodge next door called: …. which I’m hoping refers to the fall deer hunt spoils and not the guests. The closest town to our lodge was Galeton, population 1,000 and declining according to Wikepedia. Now a relatively poor town, it boomed during the wide-scale forest harvesting that took place in these hills more than a century ago. The species of most interest was Eastern Hemlock, its bark important in the tanning process, and Galeton was the site of a particularly large tannery. Despite the barren lands and tanning liquor-polluted rivers that resulted from the tanbark industry, both of which are now a thing of the past, the locals now make the most of this bit of their history. 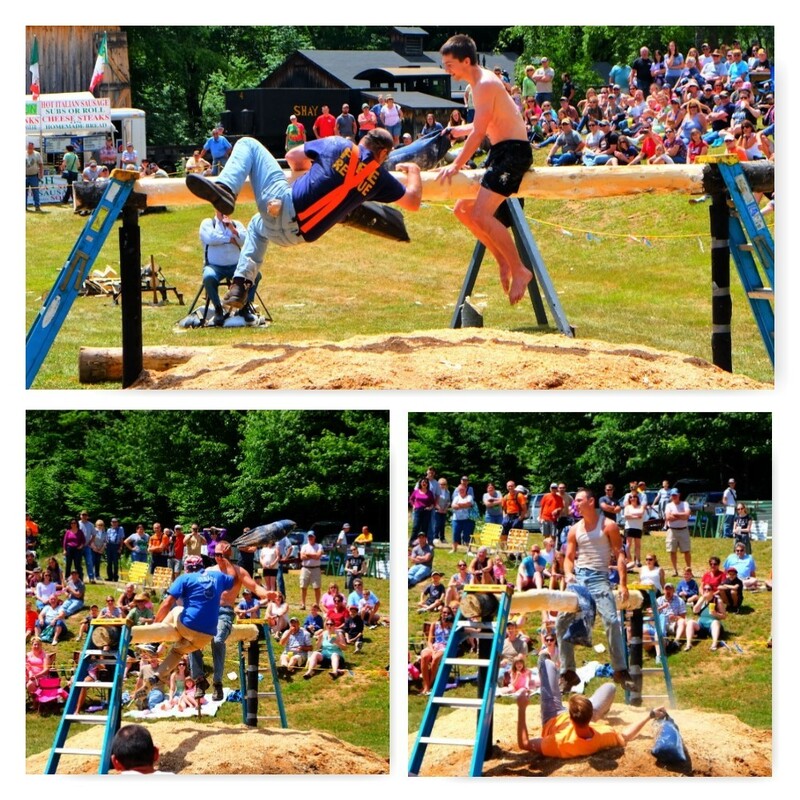 They have a festival celebrating the stripping of bark from the trees by wood hicks (as the workers were called). As it turned out, we were lucky enough to be visiting during the annual Bark Peelers’ Festival. Moreover, last year’s winner of the greased-pole competition was staying at our lodge. I had dinner with his father! But the icing on the cake came when we found out that the lodge came equipped not only with celebrities but with an 80-year old guide imported from Canada to lead our hikes. “Could we get much luckier?” I asked, tongue in cheek. The guide was so excited by the presence of the eminent figure in the dining room that he asked the champion to autograph his iPad. “Really?” I thought to myself. Understandably you are now probably wondering why it has taken me so long to visit this bit of small-town America. Yes, I wonder myself. 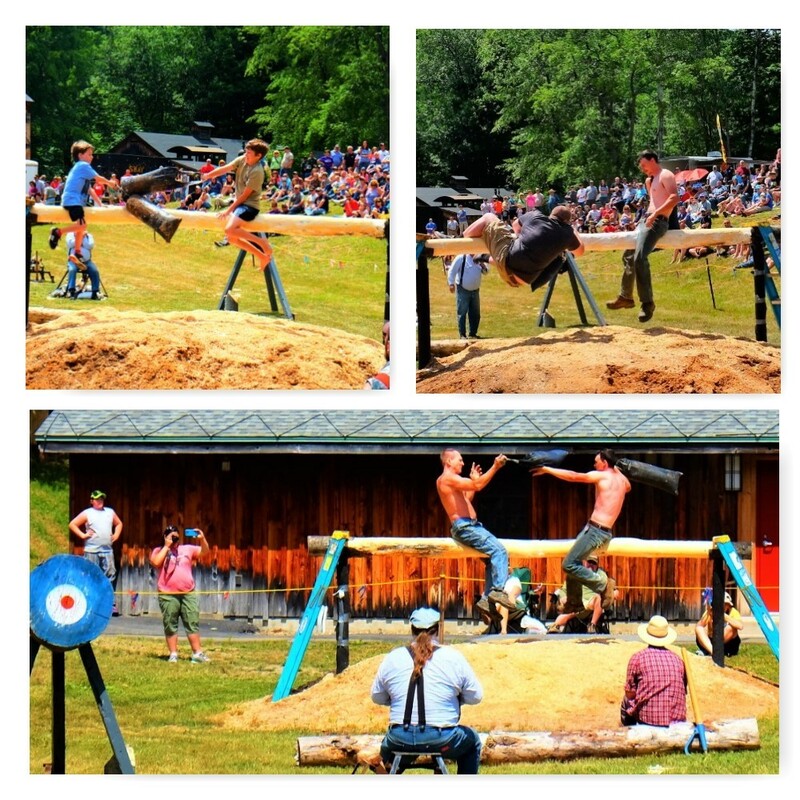 Of course we had to attend the festival, if only to see the reigning champion compete. 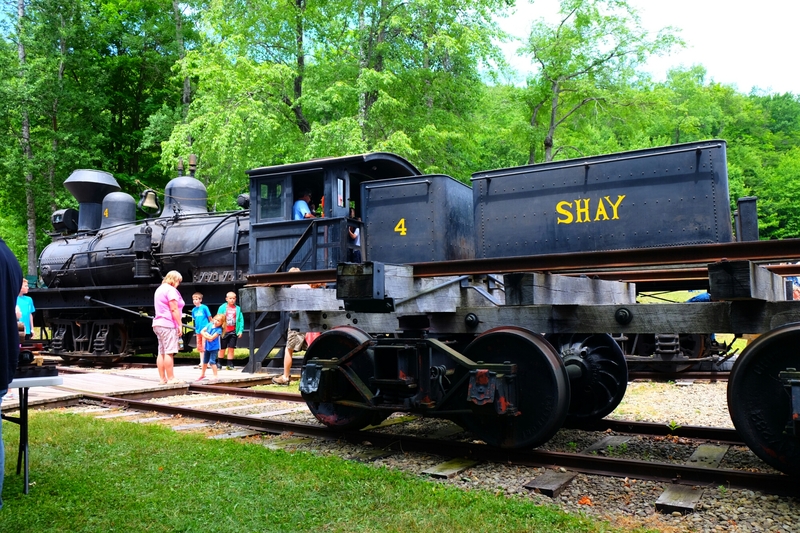 We were told there was also much more to see: a lumber museum, an old saw mill in operation and a Shay locomotive, the latter causing the men in our group to salivate with anticipation when they heard the news. Don’t worry, I hadn’t any idea what the fuss was about either, but it turns out a Shay locomotive is a uniquely designed all-wheel drive engine that allowed it to manoeuvre tight corners particularly well, haul heavy loads and climb steep grades. They were in vogue at the turn of the century in logging operations. Few survive today and the Pennsylvania Lumber Museum is lucky enough to have one. I learned this from an engineer in our group – not a Thomas the Tank Engine engineer, the other kind. There were also chainsaw carvings, music by the Burning Tractor Band with an audience of three and an apple pie contest with two entries. Quite the afternoon. 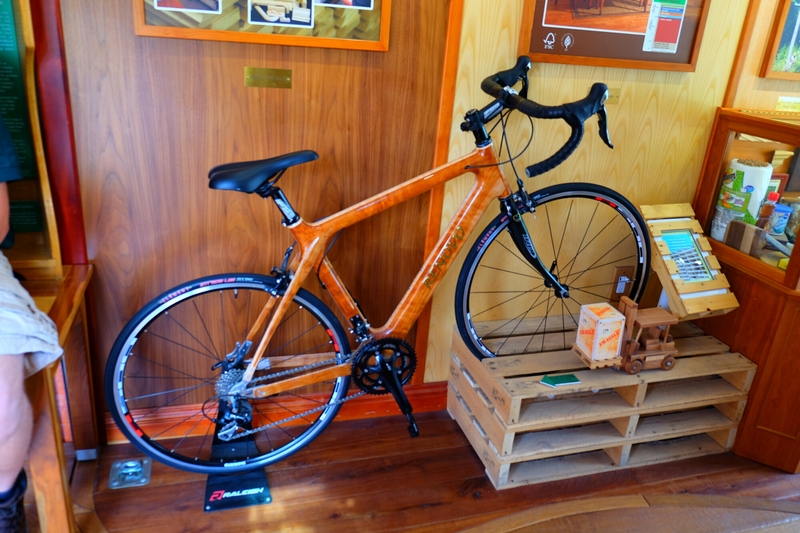 A black cherry bike caught my eye – beautiful and light; it made the visit worthwhile. Each morning we were up early as the guide had us doing yoga at 7 am before breakfast. 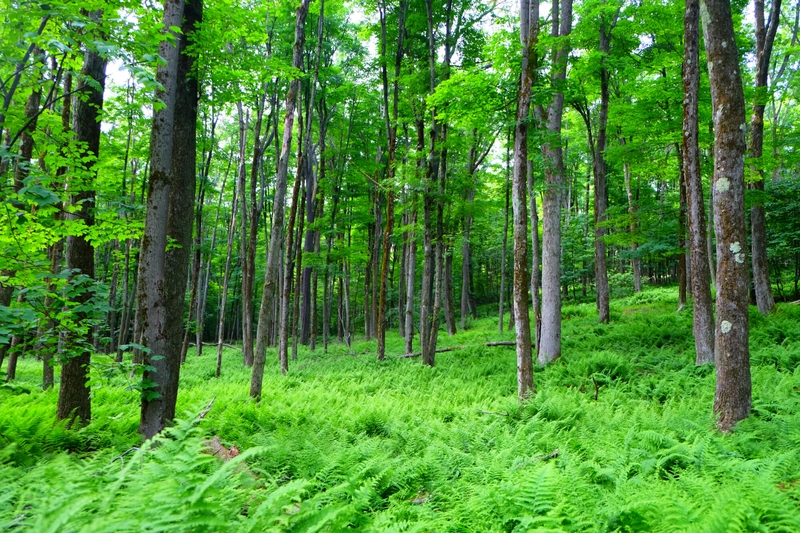 Then it was off to walk the lovely bug-free fern/hardwood forests. One day we walked the top of the gorge in the morning and cycled the bottom of it, along West Pine Creek, in the afternoon. While cycling we came across a little gem on the river tucked into the foot of the hill and accessible only by a footbridge. What a wonderful place to escape to! Finally, a trip with this group would not be complete without a few sets of tennis. This year, I was humbled by the Croatian woman wearing a proper tennis outfit and a retired postman who “bats the ball around now and again”. Unfortunately my partner had to share in my loss, but it will serve him right for acing me last year. It was time to head home after a brief 4-day glimpse into another tiny corner of the world. A nagging mystery remained, however – this sign outside a country store on a remote stretch of road. 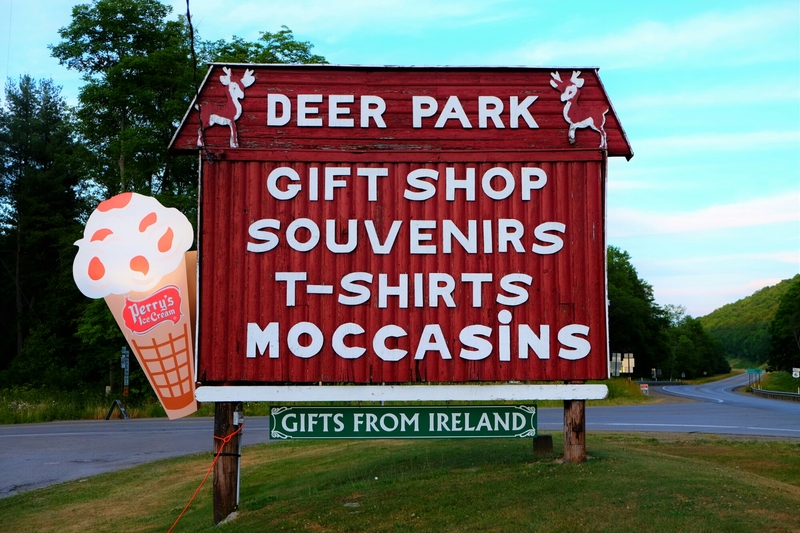 It lists things you might think to stop for when visiting this area – deer, a souvenir of the region’s important lumbering and tanning history, moccasins likely made in China but a reminder of the Susquehannock Indian tribe from whom the river and region takes its name, local ice cream made near Buffalo and found in New York and western Pennsylvania…..and, yes, certainly a gift from Ireland. It just wouldn’t be right to return home without a shamrock-printed tea towel. How odd it seemed until I peeled back the bark a little bit further. The Irish heritage of the state and the importance of Irish immigrants in coal mining, tanning, forestry and essentially in the building of America, is fondly remembered. The state itself was founded in 1681 by Irish immigrant William Penn who was given the largest-ever land grant by Charles II in honour of a debt owed to his much admired father, an Englishman who had helped restore Charles II and fought bravely, proudly and bitterly under Cromwell during the Irish Confederate wars. Then with one grand pull of the bark, the irony of it all was revealed: the young William Penn was a pacifist and Quaker and, in the eyes of his father, brought shame to his family. When you travel, you learn. Speaking of which, I’ve signed up for tennis lessons. Thanks for the Irish connection – would never have guessed. Tennis lessons are good – we’ll be ready for a rematch – I’d better practice as well though. Thanks Lee. Small towns are always better when viewed at speed with the top down from a Z4.